Custom Brick Fences have what you need when it comes to premium brick fences and gates. For high quality brick or steel fencing for Camberwell we’re your one-stop-shop. 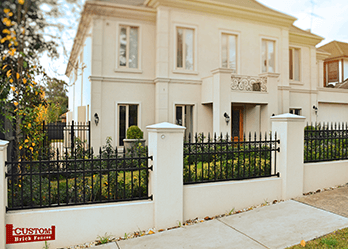 We build brick, steel, wrought iron, aluminium fences and our beautiful and practical driveway and pedestrian gates enhance your homes privacy and security. When it comes to service, quality and product knowledge, we’re the fences and gates experts Camberwell homeowners can rely on. We ensure satisfaction when it comes to quality with our custom-made brick fences and gates. 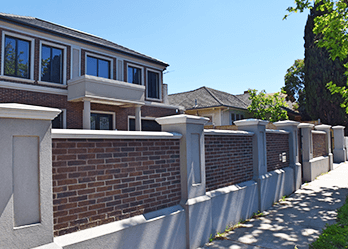 Supplying fencing to Camberwell residents for many years, we’ve built a solid reputation for our excellence in customer service and premium products. We custom design any gate or fence to suit your needs and specific style, whatever size, design or material you want – Custom Brick Fences can help you. As an added benefit to you, we also offer complete installation of fences or gates in Camberwell services to all customers. This means that when we design your custom fence or gate we make sure it fits well in the existing space at your home. 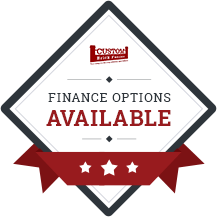 To give you an estimate of the price and look you want, we can take measurements in the space and get back to you with a free quote. When it comes to ensuring your home has absolute privacy, there’s no better option than a high-quality security gate. 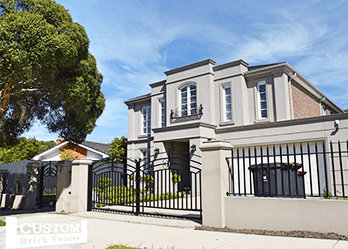 Camberwell homeowners can rely on our gates to offer full protection for their properties. From durable wrought iron gates to convenient automatic electric gates, we’ve got the perfect design and size to suit your home. Contact us today to speak to one of our specialists in fences and gates for Camberwell.